Keep your hands moisturised all day long with this perfect Shea Butter companion that will be with you where ever you go. Perfect gift of nature for someone you care about or that special occasion. Its pure and natural with no chemicals. 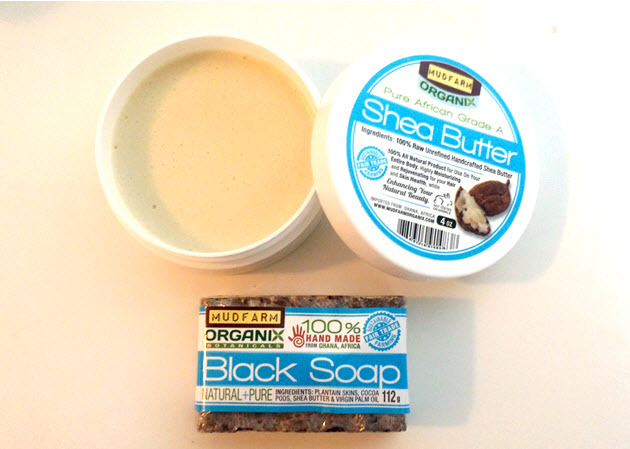 Use Pure African Black Soap followed by Mudfarm Organic Shea Butter. Perfect for your handbag or travel bag to keep you moisurized a clean wherever you go. Pure Organic Shea butter is melted to perfection, smooth and silky will melt right onto your skin. Perfect for all skin types. Use daily to heal and protect your skin. a up within a a few days ~ amazing! Leave it to nature to give us exactly what we needed! I always have one in my purse and one in my nightstand. A must have. Was not sure about this black soap and shea butter but after using it for about 2 days i notices a big difference in the tone and complexion of my skin. Being fair skin i was worried about it but so far i am very impressed and will share with others. I take the shea butter in my purse. his is literally the only product/cleanser that has helped control my breakouts and cleared my skin. I'm forever grateful that I discovered this product. I have combination/oily skin. Before using this product, i used to break out quite frequently. I tried everything from Proactiv to oral antibiotics but all had short term results with negative long term effects. I was fed up and wanted to try something more natural without all the harsh chemicals. And then, I discovered African black soap from mudfarm organix. My skin doesn't break out any more (unless its that time of the month!). But other than that, I have seen a massive improvement. This is my holy grail cleanser and I don't think I'll ever stop using it. It also super cheap and lasts very long. I recommend this product for oily/combination/acne-prone skin. It is a little drying so I would NOT recommend it to those with dry skin. Moisturize your skin liberally after use! TIP: I cut the bar of soap into little pieces and store it in a small container for easier application each time. Best acne treatment soap I have ever used. I've used a list of products that did nothing to better my acne but once I started using Mudfarm African black soap I noticed a really big difference. I refuse to use any other soap because I am too afraid nothing will control my acne. I think the best thing about this soap is the price and that it actually works compared to some products that cost so much but has little to no effect. It does tend to dry your face out but it definitely helps if you have oily skin. I use it on my face everyday when I'm in the shower and let it sit for at least five minutes. When I am done I usually don't put anything on my face afterwards. I would recommend using a sunscreen after using this soap. But overall I highly recommend. I am using this shea hand and body cream for the past year. My hands are very dry, to the point of crackng during winter weather. This is by far the most hydrating (good staying power) shea cream I have used. The cream is thick, but a little goes a long way and some massaging will do the trick. Click the button below to add the Shea Butter Moisturizer & Black Soap Bar to your wish list.